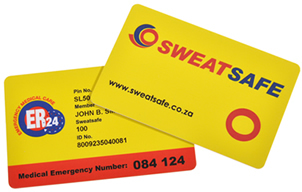 Your new Velcro or Silicone band order includes a new SWEATSAFE member card, card holder and stickers for your car, bicycle, motorbike etc. We forward your replacement SWEATSAFE pack to you by registered mail so that we can track the item and you are guaranteed of receiving your new protection. When making payment, please use your name and surname as reference. On receipt of payment, then we will dispatch your new SWEATSAFE band and/or card immediately.